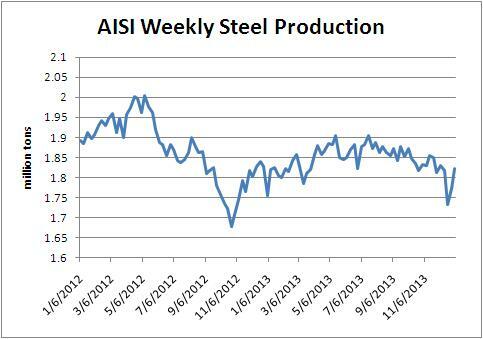 Weekly steel production continues to be steady and slow. Manufacturing has been an emotional American touchstone since George Washington wore a wool suit that had been woven in Hartford, Conn., to his first inauguration to illustrate the importance of making stuff at home. We do need to maintain an industrial presence, but perhaps not for the obvious reasons. For one thing, companies often locate research and development facilities — stuffed with high-paying jobs — near their manufacturing facilities. In addition to jobs, R&D yields high-value intellectual property that spills over into still more innovation and employment. And not surprisingly, every manufacturing position requires an additional 4.6 service and supplier positions to support it. The challenge for the United States is particularly acute because manufacturing now accounts for just 12 percent of our economy, down from a peak of 28 percent in 1953 and on a par with France and Britain as the least industrialized of major economies. While keeping that share from dipping further should be a priority, we should be careful to avoid raising false hopes (like Mr. Obama’s unrealistic second-term goal of creating a million manufacturing jobs) and pursuing ill-conceived policies (such as special subsidies for manufacturing). One of my missions in the book has been to try to get economists to stop thinking of innovation – not all economists do it but a lot of them do – as a kind of routine, deterministic, commercial application of whatever advances scientists make. This is an idea that got going in the German Historical School before Schumpeter; they said outright that the discoveries of scientists and navigators propel the whole thing. And Schumpeter, for 30 or 40 years of his career beginning with his first great book, did not deny it; he simply added a new wrinkle. He said, “Yes, that’s true, but it does take entrepreneurs to make those commercial applications, and there’s a lot of effort and hustle and know-how in that.” I think between the lines he was saying that some countries have it and other countries don’t have it. You know, though, he was writing at a time that he didn’t have the whole 20th century under his belt. We understand a lot more about a lot of things now than Schumpeter could have understood in 1911. My position is that that’s all wrong. It is the business sector that generates most of the new ideas, and these new ideas might come from anybody working in a business, maybe while walking home from work, looking up and noticing something. Caterpillar today forecast world economic growth at about 3 percent in 2014, up from about 2 percent last year. It predicted sales in its power systems and construction industries units will rise 5 percent. The resources segment, which consists mainly of mining equipment, will see revenue fall about 10 percent, it said. Steel production last week showed a slight increase but did not indicate a shift to increasing production. Weekly production was up from the prior two weeks but the down trend since mid 2013 appears to continue. 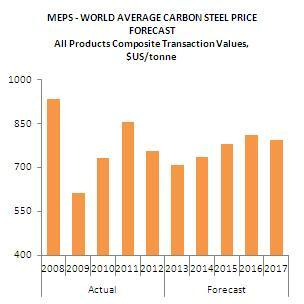 Steel production continued to be lower the last week of 2013.